We got an OLPC prototype at Collabora last week, and have been playing with the Telepathy VOIP/IM framework on the devices. Using telepathy-gabble’s (our XMPP backend) Jingle implementation, and telepathy-stream-engine with the Farsight GStreamer RTP library, we got a bidirectional voice/video call going pretty quickly using a few lines of python and a bit of hackery (patches to follow :D). 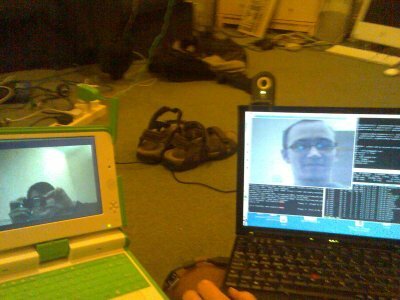 We’re going to polish this up into an activity you can install, and also Sjoerd Simons has been working with us on telepathy-salut, an XMPP Link-Local (also known as Rendezvous, Bonjour, iChat, whatever) backend which we’re hoping to also get working as part of the OLPC platform.